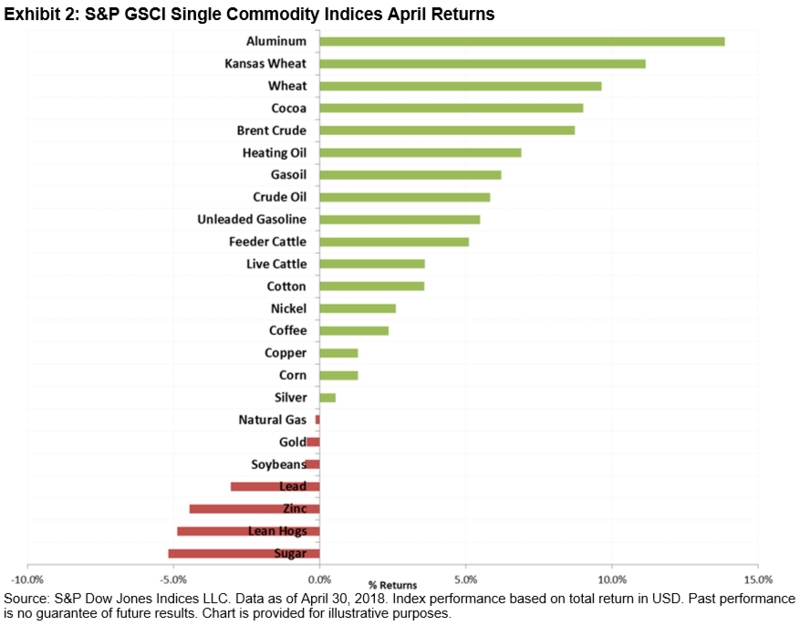 The Dow Jones Commodity Index (DJCI) was up 2.9% for April 2018 and up 3.7% YTD, while the S&P GSCI was up 5.0% for the month and 7.3% YTD. 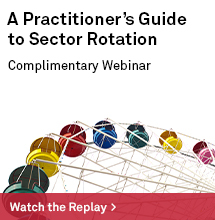 Precious metals was the worst-performing sector in the indices and energy was the best. 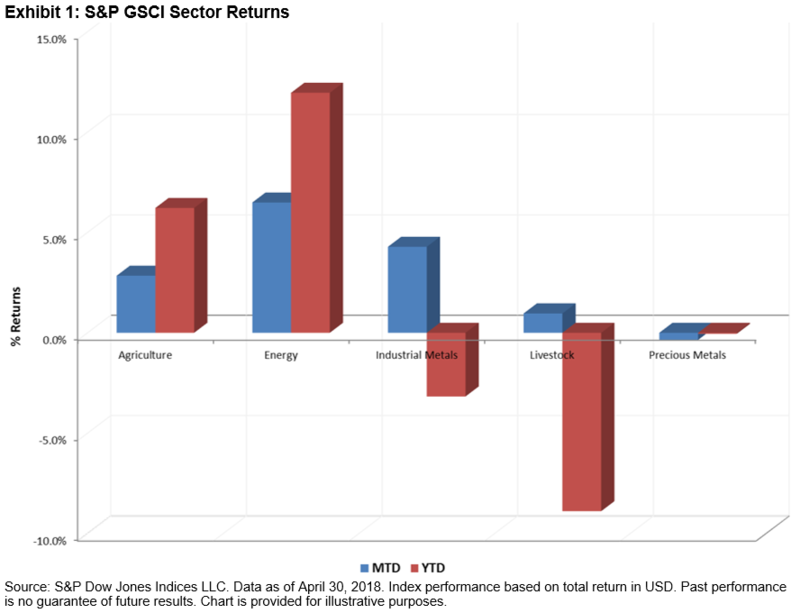 Exhibit 1 depicts the month-to-date and YTD performance of the sector indices in the S&P GSCI. Precious metals was down 0.4% for the month and flat for the year, weighed down by a strengthening U.S. dollar. Livestock’s decline of 8.9% YTD erased the gains it earned in 2016, when it finished the year up 8.4%. 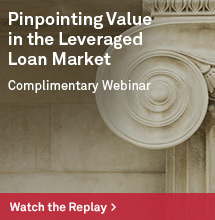 The loss was driven by price declines in lean hogs, which make up about 32% of the sector and were down 15.1% YTD because of ample global supplies. The S&P GSCI Energy was up 6.5% for the month, and all the energy commodities were positive for a second consecutive month. Petroleum prices increased as U.S. drilling declined, a decline was seen in global oil stocks, and Saudi Arabia’s Crown Prince, Mohammad Bin Salman, announced to the press in March that Saudi Arabia will be working with Russia on a deal to extend control over major exporters over a period of one to two decades. In April, Brent crude was the best performer, up 8.7%, followed by heating oil, up 6.9%. Natural gas was down 0.1%, due to warming weather conditions. Of the 24 commodities tracked by the S&P GSCI, 17 were positive in April. Exhibit 2 depicts the April performance of the single commodity indices. 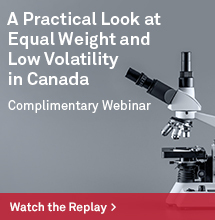 Aluminum was the best-performing commodity in the indices, up 14.9% in April, after proposed sanctions on Russian aluminum producer Rusal were announced. Sugar was the worst-performing commodity in the indices, down 5.2% for the month and off 22.1% YTD, due to a global surplus. Exhibit 3 depicts the performance for sugar and aluminum since index levels were rebased to 100 on April 30, 2008. 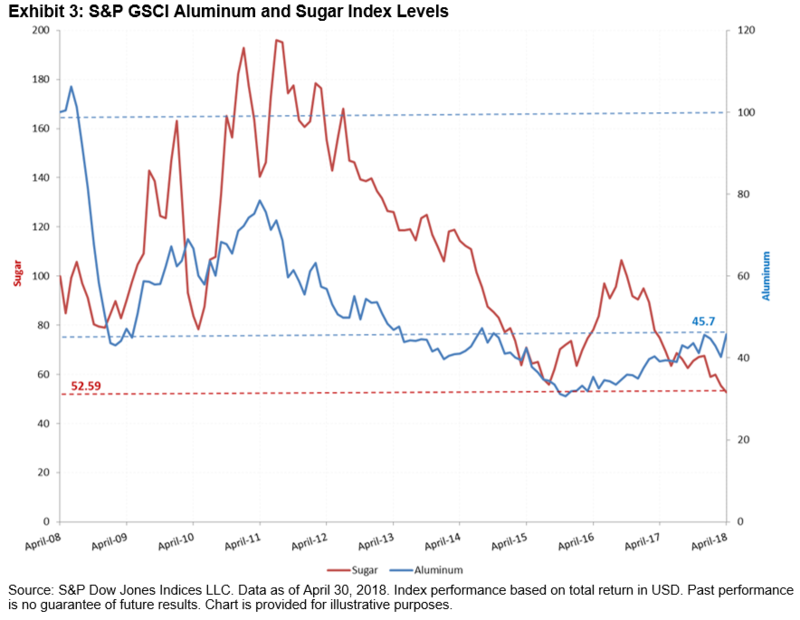 It can be seen in Exhibit 3 that the S&P GSCI Aluminum has reverted back to its late-2014 levels, when demand exceeded supply, while the S&P GSCI Sugar has reverted to its 1999 levels. 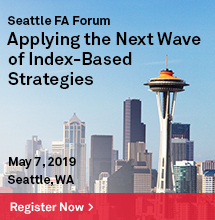 To understand the concept of index levels, a hypothetical portfolio of USD 100 tracking an index based at 100 would increase by USD 20 if the index levels increased to 120 and decrease by USD 20 if the index level declines to 80.